sensoren spielen eine zentrale rolle an der schnittstelle zwischen realen und virtuellen welten, indem sie physikalische aktivitäten in elektrische signale wandeln. die notwendigen technologien, dies in künstlerischen projekten einzusetzen sollen in diesem workshop vermittelt werden, angefangen von der auswahl der sensoren, über den aufbau von geeigneten verstärkern und dem einsatz von interfaces, bis zur programmierung des zielcomputers. the dyne.org foundation organizes workshops about free software and introduces participants to the use of 100% free gnu/linux systems for use in their artistic work. each participant receives a dyne:bolic cd with the necessary software, which may be freely used and further distributed [gnu gpl license]. the purchase of further commercial software becomes superfluous - participants can produce and distribute their own works: unaffected by commercial suppliers' speculations. a practical introduction to interactive systems based on sensor technology, which were developed by andrey smirnov to measure and control the movements of people and materials. the method of building the sensors relies on the same principles which are the basis for the functioning of the theremin. the workshop not only offers insight into the theory and history of sensor technology, but also facilitates the development of practical components for the control of interactive audio and video installations. 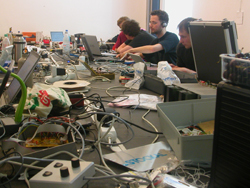 participants should bring not only their laptops, but also knowledge of programming with max/msp, pd, supercollider, isadora and similar software. analog and digital usb sensors will be available for trial and experimentation. there will be a presentation of the work results at the end of the workshop on 15. june.